As with previous Fire Apparatus Journal books, the compiling of the data in this publication was a joint effort on the part of several people. Being second in a series of similar books, the format of this book was easy to establish. However, much research and verification of facts was still required. .
Once again, Jack Lerch proved invaluable to this project, particularly in researching and verifying data. Jack also proof-read and corrected the manuscript, allowing for the most accurate data possible. . The majority of the photos and data used herein came from the collections of the author and of Jack Lerch. Many other photographers and collectors also assisted by either sharing their collections or working long hours in the darkroom, providing exactly what was needed. Some . In some cases it has been impossible to identify the photographer. We apologize in advance if we unintentionally overlooked anyone..
As usual with Fire Apparatus Journal projects, Elena Miranda designed and implemented the layout of this book. Without her assistance this project would not have been completed. . This book covers the history of those vehicles including several conversions along the way. It should be noted that certain statements made describing equipment on a particular group of apparatus apply to the way that group was delivered. In many cases, mod)fications were made over the years to the apparatus, particularly in the area of warning lights and equipment. In later years it was possible to find a chrome radiator grille on an apparatus that was delivered with a painted one. . The numbers under the pumpers are all engine companies. A "wagon" or "W" after a number indicates that the vehicle was assigned as the second piece of a two piece engine company. In later years both "pumper" and "wagon" were pumpers to provide greater fireground flexibility. The vehicle itself was only lettered for the assigned unit with no indication that it was a "wagon." An "R" indicates a rescue company while an "SQ" indicated a squad company. Most of the L-Models became spares after their last assignment. The only time a "spare" will appear is when that unit was a spare between permanent assignments. Many apparatus were used by the various Training School programs, but were not actually assigned to these. Only those units actually assigned to the Training School are so indicated in this book. Mention should be made that several of these rigs were transferred directly from the fire department roster to other agencies. These are recorded here. All of the other L-Models were disposed of through the city's auction procedures. At least two, and possibly more, moved on to other fire protection agencies but these are not recorded here. On the eve of World War II, Mack introduced its famous L Series of trucks. These vehicles possessed a rugged look coupled with attractive styling for the time. The L-Model was produced over a seventeen year span with over 33,000 examples manufactured. Obviously, the majority of these were commercial trucks and not fire apparatus, but quite a large percentage were built for f~refighting. Several different motors were used with a fourspeed transmission being common. The L-Model was available in a wide variety of cab and body configurations, resulting in many unusual and unique fire apparatus as well as commercial trucks. Scheduled to be introduced in 1940, New York City was quick to embrace the new L-Model, placing an order for eight LS-Model hose wagons on June 22, 1939. These units cost $7,327.00 per copy and were placed into service less than a year later on June 8, 1940, following rigid acceptance tests. They were designated Type 19-LS, had closed cabs, rear-step windshields, and the "subway strap" hand holds that were common for New York's rigs at that time. Warning devices included a Mars light, Buckeye exhaust whistle, and interior mounted H.O.R. beltdriven sirens. The power plant consisted of a model KY-5 Mack Thermodyne six-cylinder valve-in-head engine and a Mack manual four-speed transmission. They were 26 feet, 9 inches long with a 190-inch wheelbase. A large forwardfacing Morse 2000 8pm deckpipe, with 1-1/4, 1-1/2, and 1-3/4 inch tips, was mounted immediately behind the cab. It could be supplied through a "Y" supply inlet on either side of the body. A raised basket to carry rolled and folded lengths of hose was positioned behind the deckpipe. Also common for the time period, each hose wagon was initially delivered with a spare tire mounted at the rear of the running board on the chauffeur's side. A twelve-foot scaling ladder was mounted on each side of the hose body as were nozzle and hose ffflng brackets and mounting brackets for hand tools. Mounted above the bell on the officer's side was a large floodlight. These units had plenty of chrome f~nishing including the radiator grille and bumper. The fenders were more than adequately adorned with gold leaf and scroll work. Seven of the eight wagons were eventually converted into squad rigs. One of these later became a power supply unit. The eighth wagon became a dedicated spare for the rescue and squad companies. Most were disposed of in the early 1960's but the power supply unit remained on the roster into 1977. Before June, 1940, was over, New York placed another order for LS-Models with Mack Trucks, this time for twelve pumpers. Ordered on June 27, 1940, these 1000 8pm closed cab pumpers were designated as Type 21-LS and were purchased for $13,208.00 each. They were accepted on October 24, 1941, and entered service during November and December, 1941. In appearance they were quite similar to the 1940 hose wagons, but were 26 feet, 5 inches long with a 202-inch wheelbase. They were powered by a Hercules six-cylinder model HXE engine with a Brown-Lipe four-speed transmission, although three of these units (registration #1021, 1023, and 1026) were later repowered with Waukesha motors. The same warning devices were on these rigs as were on the 1940 hose wagons. One suction inlet and two discharge outlets were located on each side, with the supply "Y" for the deckpipe located further to the rear than on the hose wagons. The deckpipe was provided with 1-1/4, 1-1/2, and 1-3/4 inch tips and a Spencer valve. The pump was a Hale four-stage centrifugal model. One length of suction hose was mounted under each scaling ladder. Most of these units became spares for several years before being disposed of in the early 1960's. Two of them, #1021 and #1023, were acquired by interests in Greece on June 20, 1963. Two additional units, #1024 and #1025, were transferred to the Department of Corrections for use at city prison facilities on various islands within the city limits. Manufacture of civilian commercial vehicles was virtually non-existent during the war years. Many undelivered chassis were reappropriated, being allocated to military and essential civilian users. Chrome plating for exterior use on motor vehicles was prohibited due to its necessity in war production. Mack fire apparatus production was moved from the plant in Allentown, Pennsylvania, to Long Island City, New York, near the New York Fire Department shops. Chassis were built in Allentown and driven to New York where all custom fire apparatus bodywork was manufactured. Only a small portion of Mack's wartime fire apparatus production was allocated to civilian users, while the bulk of their effort went to produce bodywork for the Army Air Force Class 155 airfield fire truck which was mounted on the chassis of various manufacturers. Civilian production of the L-Model was cut during 1942 and resumed on a limited basis in late 1944, when small numbers were allowed to be produced for essential users. New York, like many other fire departments, was hard pressed for apparatus during the war. Not having been able to procure a proper number of replacement apparatus during the depression years, the department was forced to operate with apparatus that should have been removed from the roster years before.. Finally, in 1944, New York was able to obtain ten additional 1000 8pm Type 21-LS Model pumpers that were almost carbon copies of the 1941 models. However, these were delivered without any exterior chrome and were easily identified by their painted radiator grilles, headlights, bumpers and deckpipes. Even the ornamental chrome strips on the side of the engine hood were omitted. These parts were chrome on the 1941 models. Warning devices were the same as on the earlier L-Models. The 1944 units were delivered at a unit cost of $12,938.00, $270.00 per unit cheaper than the 1941 models. They were the first pumpers that New York was able to obtain since the start of the war and were only a "drop in the bucket" when considering the total F.D.N.Y. fleet that was in need of replacement at the time. All ten entered service on May 10, 1944 and were equipped with Hercules six-cylinder model HXE motors, Hale model 22M four-stage pumps, and Brown-Lipe four-speed transmissions. They were 27 feet long, six inches longer than the 1941 models, and had a wheelbase of 200 inches. The 2000 8pm Morse deckpipe was controlled by a Spencer valve and had 1-1/4, 1-1/2, and 1-3/4 inch tips. All of these pumpers remained on the roster into the early 1960's with two, #1033 and #1039, being transferred to the Department of Corrections during January, 1964. There were few changes made to the basic L-Model line by Mack Trucks through 1946, primarily because of their commitment to war production. .
As quickly as financially possible following the end of the war, New York moved to purchase pumpers to upgrade its aging fleet. Twenty 750 8pm Ward LaFrance pumpers were purchased in 1946, followed by twenty American LaFrance 750 8pm pumpers in 1947. Mack also delivered twenty 750 8pm pumpers during 1947 from two separate orders of ten each. They were placed into service from June through August, 1947. These were designated Type 85-LS and were semi-open cab models, having cab doors and a unique windshield that gave the appearance that the roof had been cut off. The cab doors had angular half windows adding further to their unusual appearance. They were 25 feet long, had a 182inch wheelbase, were powered by a Mack six-cylinder Thermodyne motor and a Mack four-speed transmission. These units had the same basic hose bed design as the earlier L-Model pumpers but did not have the windshield at the rear step. A 2-stage Hale 750 8pm centrifugal pump was provided instead of a 1000 8pm model. To compensate for the lower capacity, there were two discharge gates on the chauffeur's side but only one on the officer's side, with suction intakes on each side and at the rear. The larger square style bumper that was present on the earlier L-Models was replaced with a smaller, chromed, more rounded bumper, and the radiator grille was painted rather than chromed. A 2000 8pm Morse deckpipe was also provided. Again, the warning devices consisted of the same equipment as previous L-Models. The purchase price of these pumpers was $15,113.00 per vehicle. Many of these units had three assignments during their service life. A handful were assigned to four units. Most of the 1947 pumpers eventually served as the second piece (hose wagon) of two piece engine companies. The vast majority of these rigs were disposed of during 1969. The following year saw Mack deliver an enclosedbody rescue truck, with bodywork built by Approved Fire Equipment Company located on Long Island. It was accepted on March 8, 1948. The purchase price of this unit, which was designated model LF, was $26,600.00. The body and compartmentation was designed by the members of Rescue Company 1 and was tailored to the specific equipment and needs of that unit. The vehicle had a walkthrough body with many interior compartments, as well as six exterior compartments on each side and another two at the rear of the body. It was equipped with a 2400 watt Homelite generator, three 500 watt and one 250 watt floodlights. There were also two windows high on each side of the body. This rig was 26 feet long, 9 feet, 3 inches high, 7 feet, 11 inches wide and had a 176-inch wheelbase. It was powered by a Mack six-cylinder Thermodyne engine with a Mack five-speed transmission and was delivered with a Mars light and an externally mounted Sireno siren. Production of fire apparatus at Mack's Long Island City plant continued into 1951, when it was gradually transferred back to Allentown. New York's pumper purchases during the early 1950's were dominated by Ward LaFrance pumpers and quads. This changed late in 1953, when delivery started on twenty-five 1000 8pm high pressure pumpers. The original contract for these units was issued on September 25, 1952, at a cost of $17,760.60 per copy. These were open-cab units without doors and were typical of the then current F.D.N.Y. design, maintaining the basic hose body configuration of the earlier L-Model pumpers. They were 25 feet, 9 inches long with a wheelbase of 186 inches and were powered by a Mack Thermodyne six-cylinder engine. The older, square style bumper and a chromed radiator grille returned on these rigs. Since the pumpers from this contract were placed in service during 1954, they are commonly termed 1954 models. 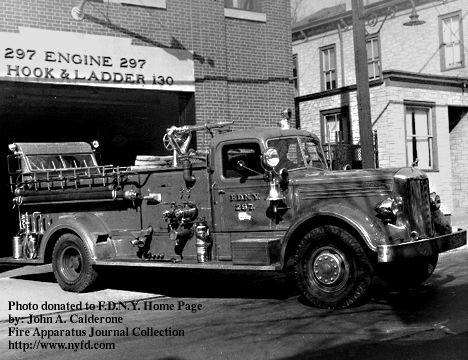 All entered service during January and February of 1954 and were initially assigned to engine companies that were located within the business districts of Manhattan that were protected by the high pressure pumping system, replacing the apparatus of every engine company located south of 38th Street. Basically, these pumpers were ufflized to allow the for the high pressure pumping system and its associated pumping staffons to begin being phased out. They were designated Type 19-LSHP and were equipped with Hale high pressure, four-stage centrifugal pumps. Originally delivered with externally mounted Sireno sirens and without Mars lights, many engine companies acquired such lights from apparatus being disposed of and installed them on the 1954 rigs. The vast majority of these pumpers served into the early 1970's with one being converted to a spare for the Superpumper System (#1112) and staying on the roster until October, 1978 and another being converted into a foam unit (#1090) and lasting into 1981. One, #1107 was transferred to the Department of Corrections on July 10, 1970, and another, #1113, was acquired by Dunns, Arkansas. Also in 1954, New York found itself in a criffcal need of a rescue apparatus. There were no suitable spare rescue trucks available. One of the 1940 LS-Model hose wagons that was assigned to Engine 203 at the time, #284, was converted by the shops to operate as a rescue truck with most of the specialized rescue tools being carried in the mod)fied hose bed, covered by tarps. In addiffon, a radio was installed in the apparatus. At the time, only special units, fireboats, and chief's cars were equipped with radios. This was the first of several conversions that the fleet of 1940 hose wagons would go through. This unit became a dedicated spare for the rescue and later the squad companies. For several years prior to this, various 1940 Mack hose wagons had been used as spares for the rescue companies, most notably those assigned to Engines 30, 73 and 203. Several new models were introduced by Mack from 1953 tbrough 1955. The L-Model was gradually phased out during these years, being replaced primarily by the BModel. However, New York's L-Model story doesn't end here. A new type of unit, the "Squad," came on line in New York City during 1955. Four squads were placed in service that year. The purpose of the squad units was to provide addiffonal manpower during the critical initial stages of operations in the heavy-working areas. A reducffon in firefighter's working hours without provisions for maintaining adequate manning levels on duty resulted in a citywide manpower shortage, with most engine and ladder companies undermanned. This was having a serious effect on operations, especially in the busy tenement areas. In order to provide apparatus for these new units, four of the 1940 LS hose wagons were converted by the department shops with the installation of bench seats in the hose bed and provisions made to carry basic hand tools and masks. Two more of the hose wagons were converted in a similar manner during 1959 with another converted in 1960. Most of these converted apparatus remained in service with the squad companies for only a short period of time, as purpose-built squad rigs were purchased from 1958 through 1962, quickly replacing the converted hose wagons. Two of these units were later assigned to the Training School where they were used for training and transportaffon purposes. During the late 1950's, blueprints and specificaffons were drawn to convert another of the 1940 hose wagons, #278, into a deluge unit. The plans called for a 5-inch barrel, Stang type deckpipe to be located behind the cab and two smaller 3-inch deckpipes at the rear step. The apparatus was brought into the shops for several weeks for preliminary work but the project never got beyond this stage. An unusual conversion was accomplished during 1962. Hose wagon #277, which had been previously converted into a squad apparatus, was once again converted, this ffme into a power supply unit. The conversion was accomplished by the department shops and included completely enclosing the rear body, installing a 35KW AC generator, a 10KW DC generator, and the addition of required electrical accessories and equipment. The "new" apparatus was designated the Emergency Power Unit and was lettered "Power Supply." Civil disturbances spread across the country in the mid-1960's and New York was particularly affected. Sporadic bottle, brick and rock throwing incidents continued on a regular basis for many years, becoming a routine occurrence that New York's firefighters had to deal with. As a result of these incidents, apparatus in service during 1967 and 1968, most of which were open-cab models, were retrofitted by the shops with plywood roofs installed over the open cabs and back steps and protective nonflammable covers over the hose beds. These were designed to protect the hose from attacks by Molotov Cocktails being thrown at responding apparatus. The 1954 L-Model pumpers were so equipped and gave the appearance of being covered wagons. During 1972, two of the 1954 pumpers were converted for other functions. During August, 1972, pumper #1090 was returned to service following a shop conversion into a foam unit. Most of the piping and equipment that had been installed on a 1946 Ward LaFrance pumper was transferred to this unit. It had a 380-gallon foam tank, with a special foam applicator attached to the deckpipe. The hose bed was used to carry an additional supply of foam in five-gallon containers. Eventually, plywood doors were installed on the cab of this apparatus. It served until 1981 when tbe foam equipment was once again transferred to another apparatus, this time a a 1975 Mack CF pumper. The second conversion of 1972 was of 1954 pumper #1112 which was returned to service in November, having been mod)fied to carry the large diameter hose of the Superpumper System and being lettered "Satellite Unit." It was used to provide a spare apparatus for the three Superpumper System satellite hose wagons and occasionally the Tender, as these units were beginning to show their age, having provided heavy service since 1965. This rig remained on the roster into 1978 when rebuilding of the original three 1965 Mack satellites was completed. When the first L-Model apparatus entered service in New York City in 1940 they were the epitome of current technology and a modern departure from the 1930's styling of much of the then current F.D.N.Y. fleet. Their service spanned a period of over forty years and included service in some of the most active units of the time. Their classic design and styling was common on New York's streets, classic vehicles in a classic era.